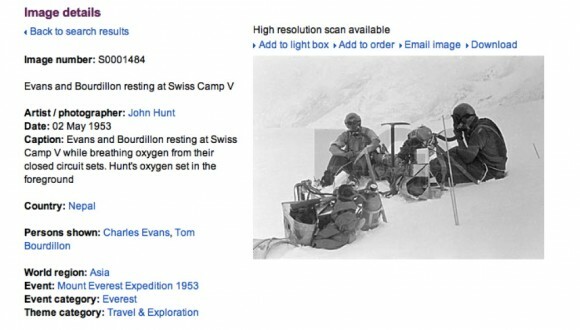 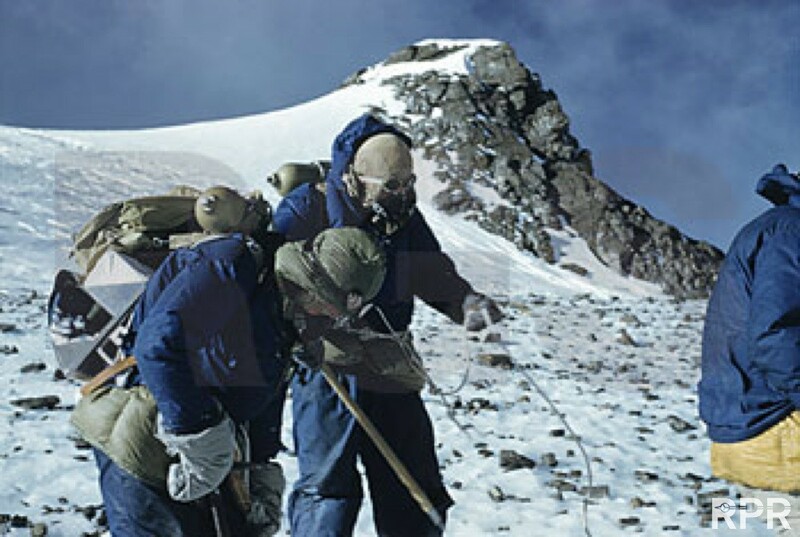 The first summit assault (1953) On this day, 26 May, Tom Bourdillon and Charles Evans had been the two highest men on earth! 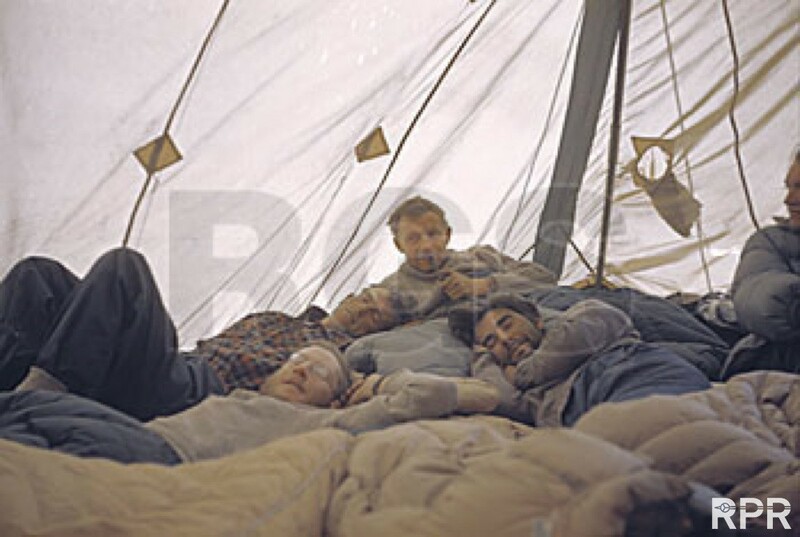 They had made the first attempt to reach the summit of Everest and had climbed as high as the South Summit. 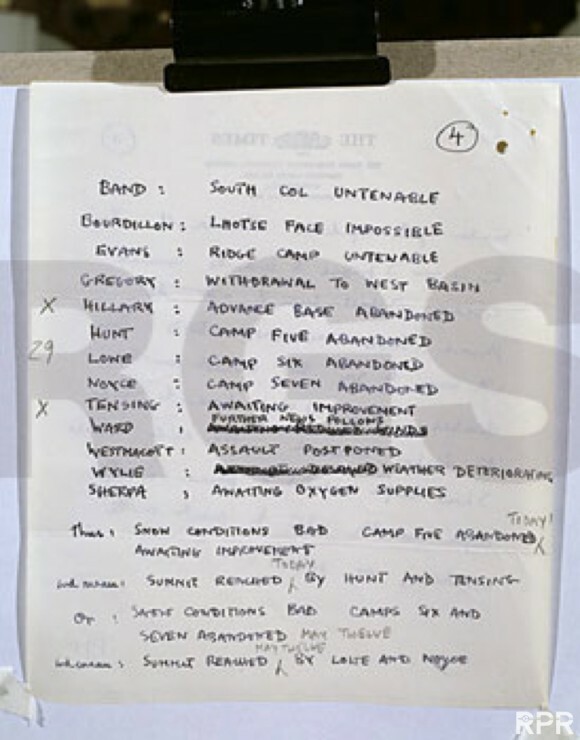 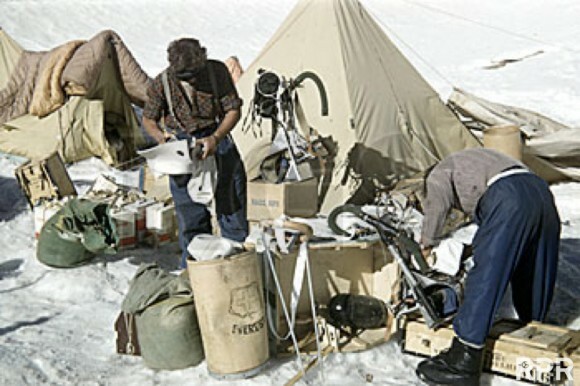 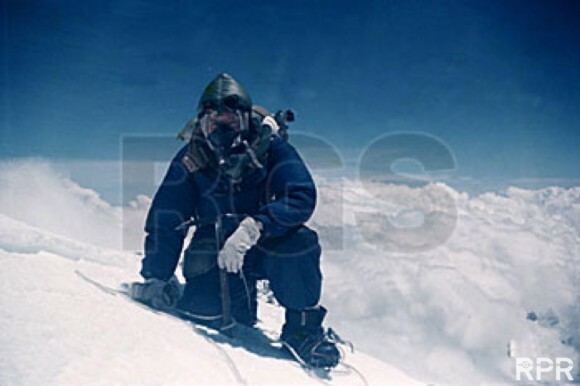 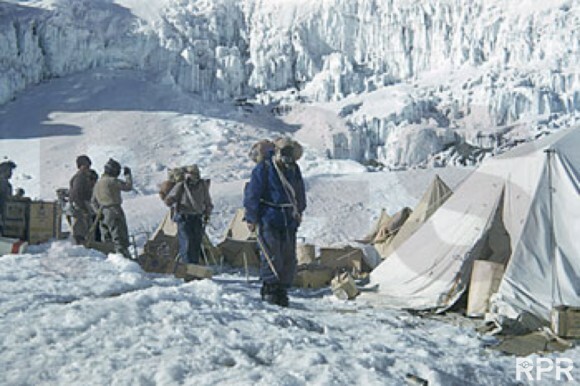 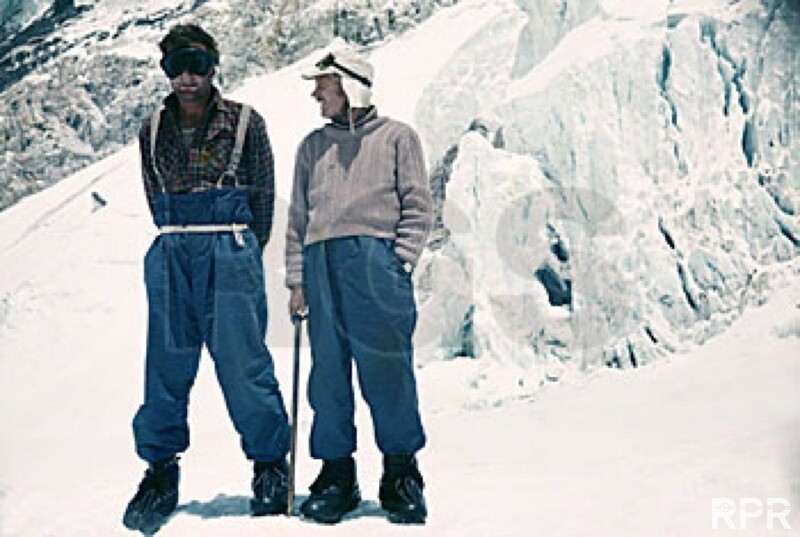 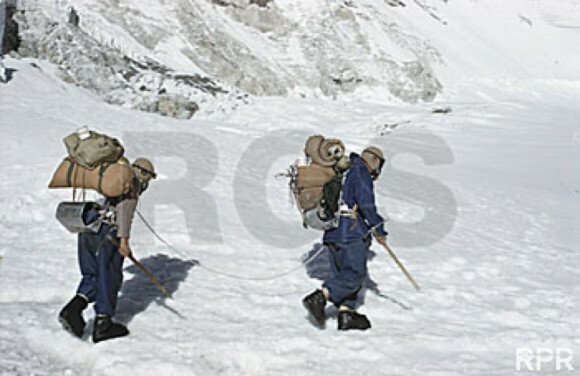 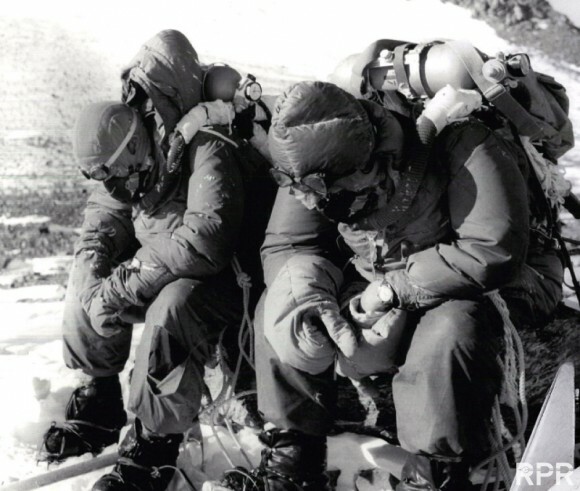 Both used a closed circuit oxygen set ( rather than bottled oxygen), which did not work too well at that height, and they were without support that Hillary and Tenzing had for the second attempt, 29 May 1953. 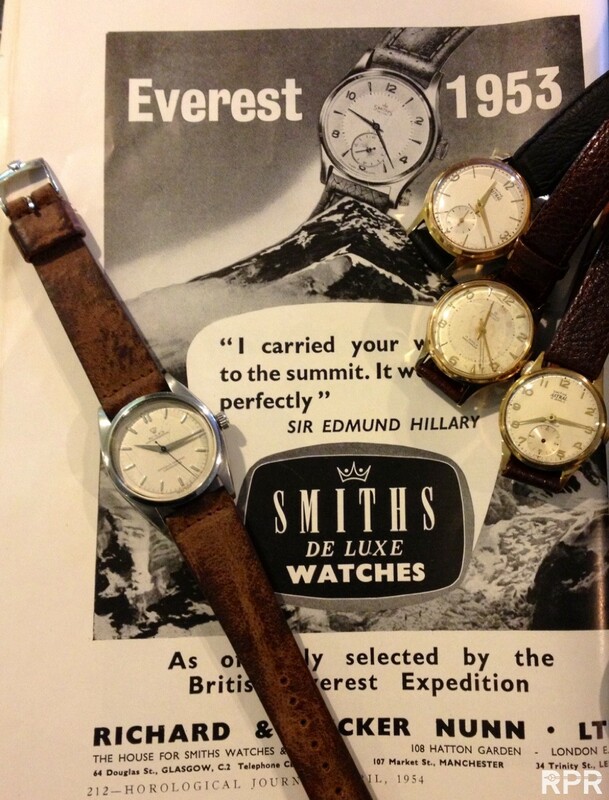 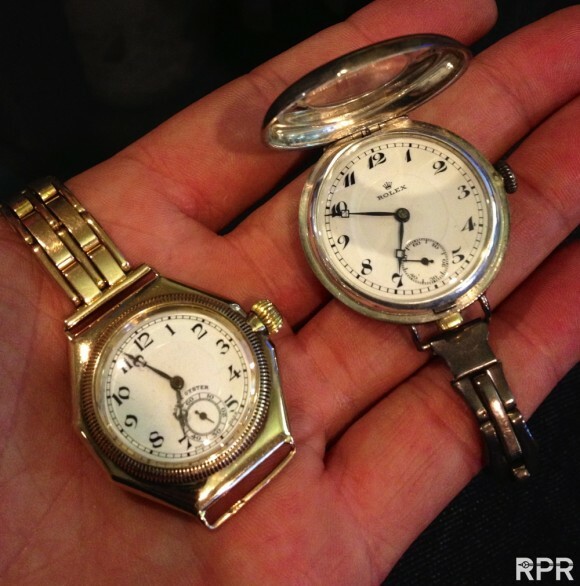 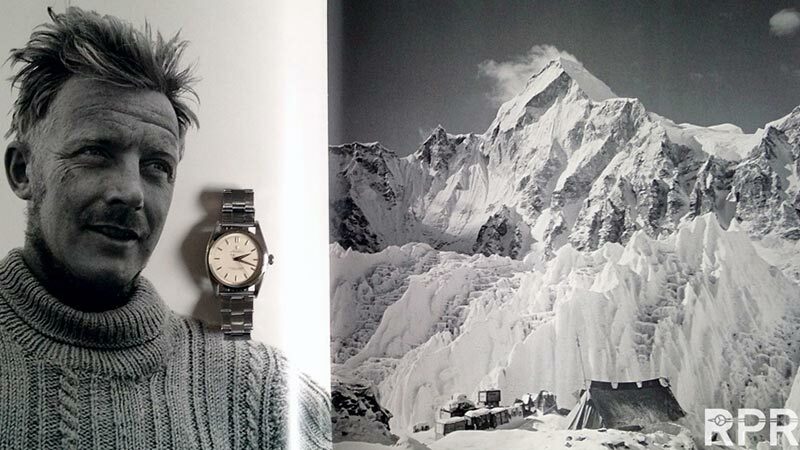 Dr. Charles Evans, honorable member of the British 1953 Everest Expedition & his original untouched Everest Rolex. 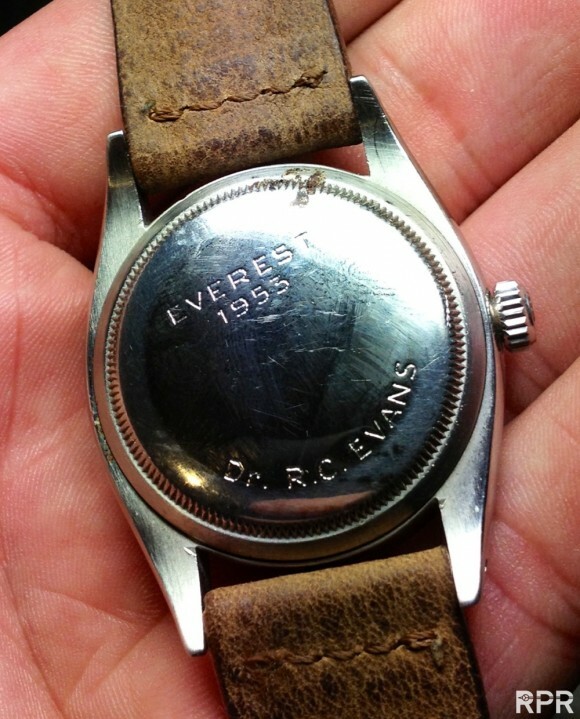 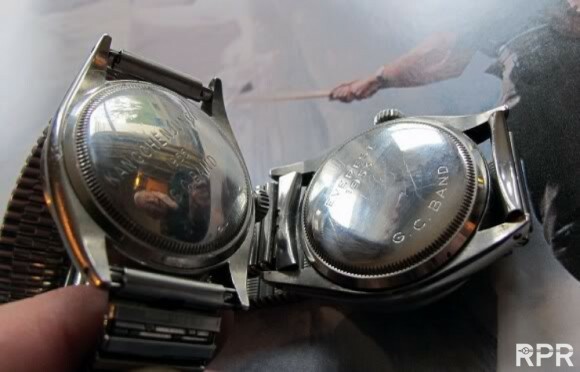 Dr. Charles Evans & Mike Ward @Everest Base Camp 1953..
Close up of my wrist shot with legendary 1953 Everest Rolex of Dr. Evans..
And directly after Charles Evans & Tom Bourdillon first assault, May 26th 1953, both being totally exhausted due to the failing oxygen tanks. 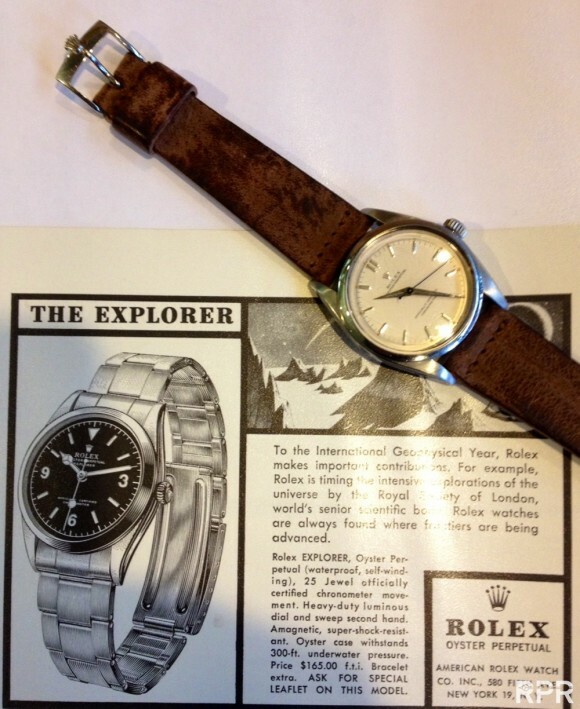 And yes, clearly visible again, Dr. Evans Everest Rolex!.. 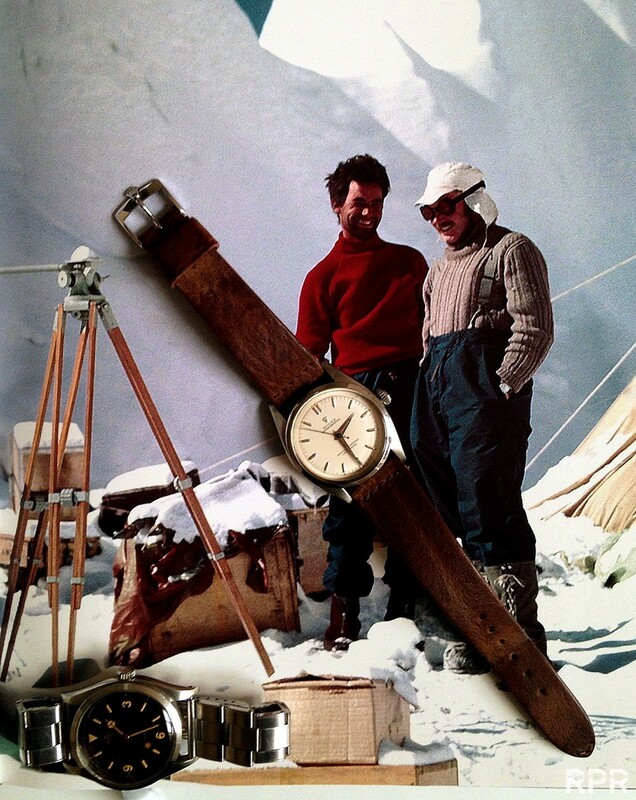 The Ultimate Expedition & Mountaineering Watch, the Everest Rolex Oyster Perpetual of Charles Evans..
Now with clean tropic, in all it’s legendary glory! 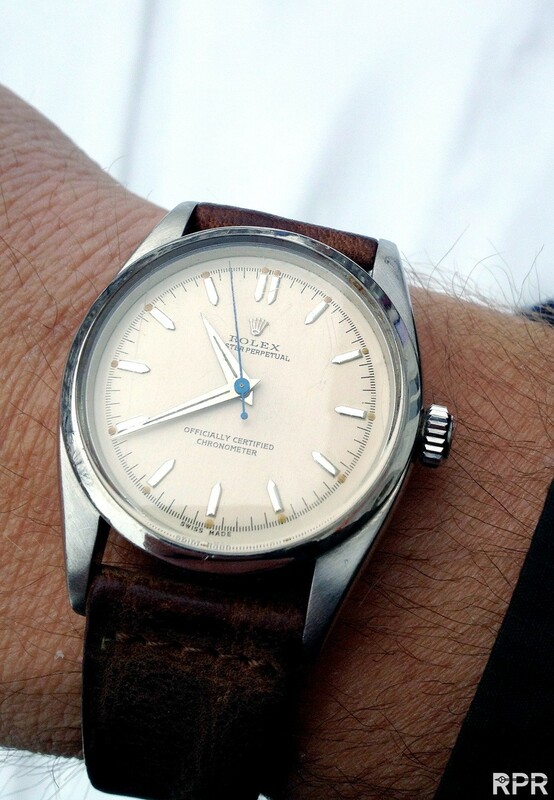 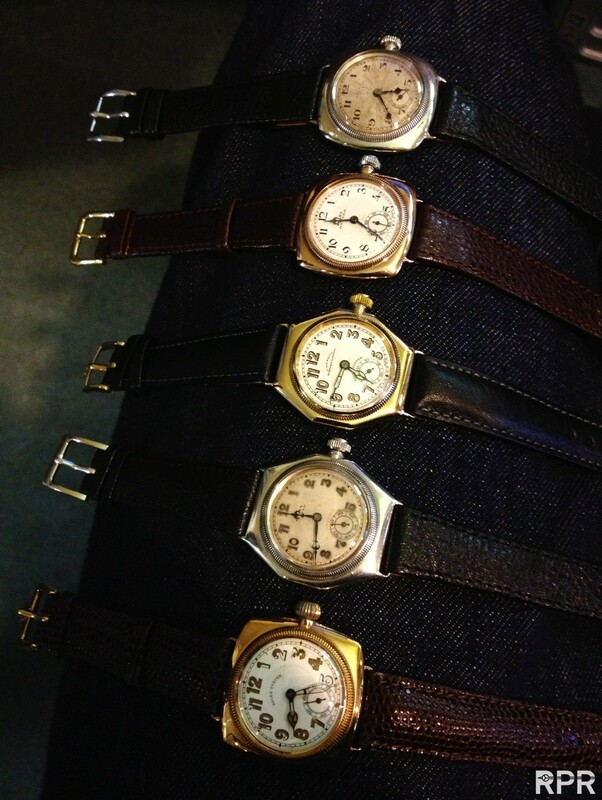 What a amazing important tool watch & beauty it is!.. 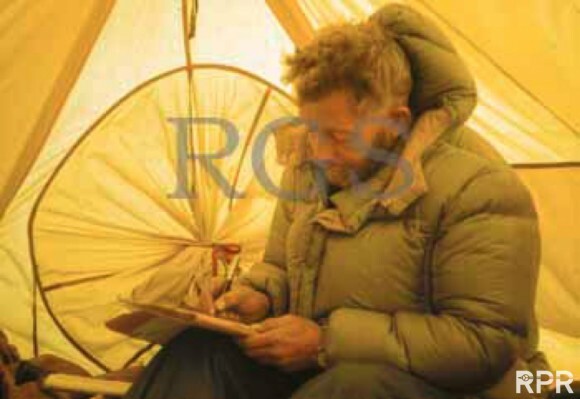 Sir Robert Charles Evans M.D., DSc, (19 October 1918 – 5 December 1995), was a British mountaineer, surgeon, and educator. 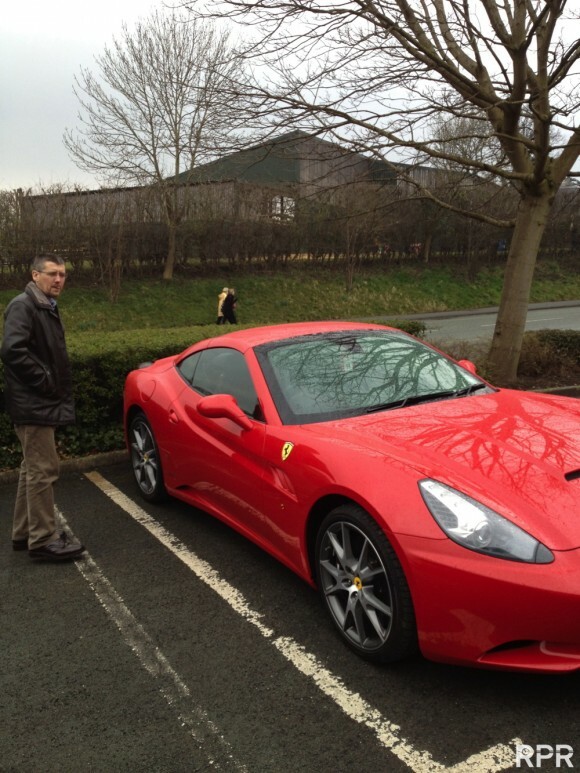 Born in Liverpool, he was raised in Wales and became a fluent Welsh language speaker. Educated at Shrewsbury School and Oxford University, where he studied medicine, he qualified as a doctor in 1942 and joined the Royal Army Medical Corps. 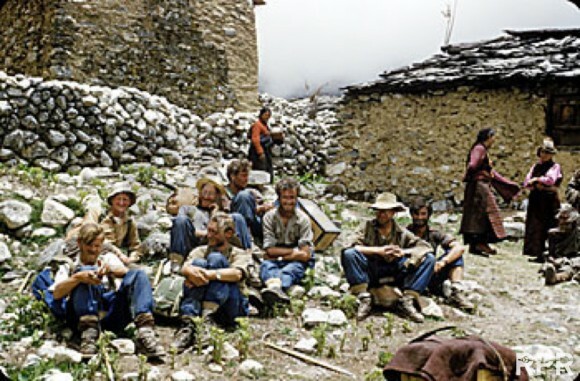 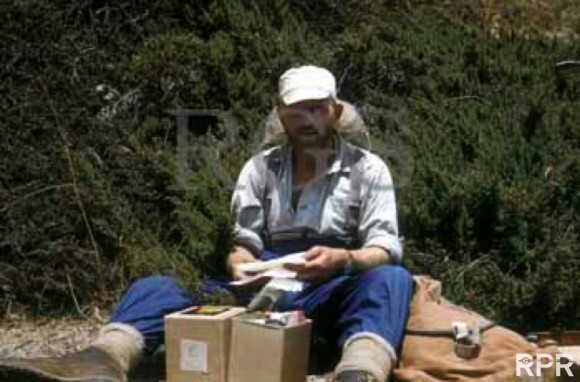 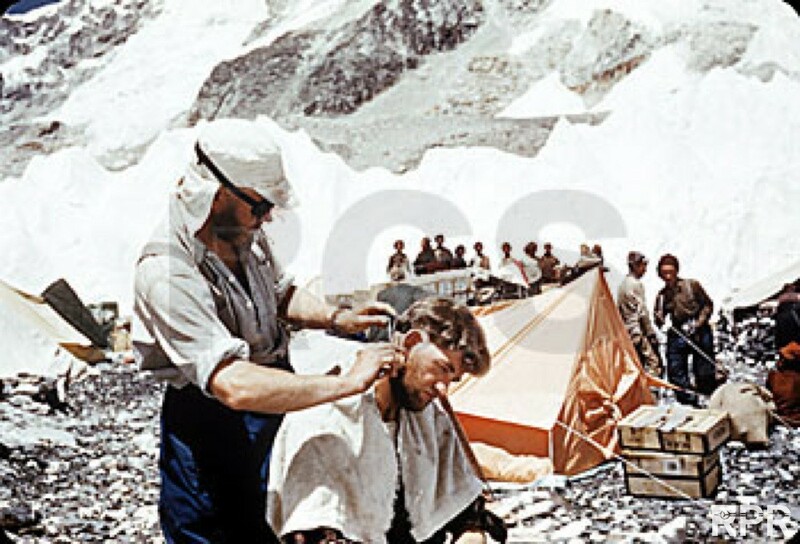 He had previously climbed many of the classic routes in the Alps and put this experience to good use during travels in Sikkim and the Himalaya during the war. 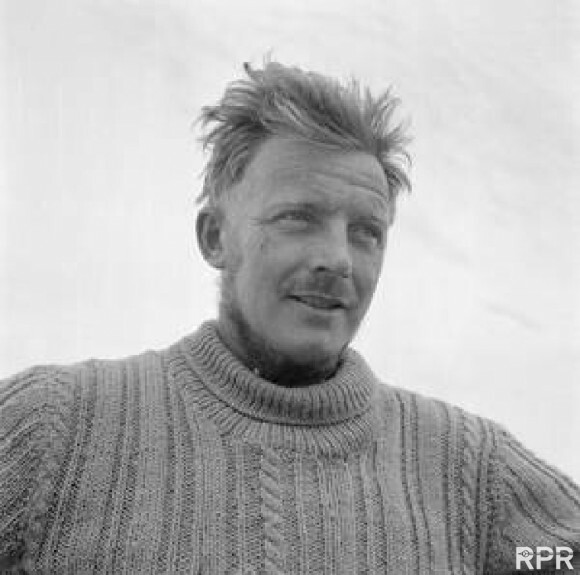 After demobilisation in 1947, he was a surgeon in Liverpool until 1957. 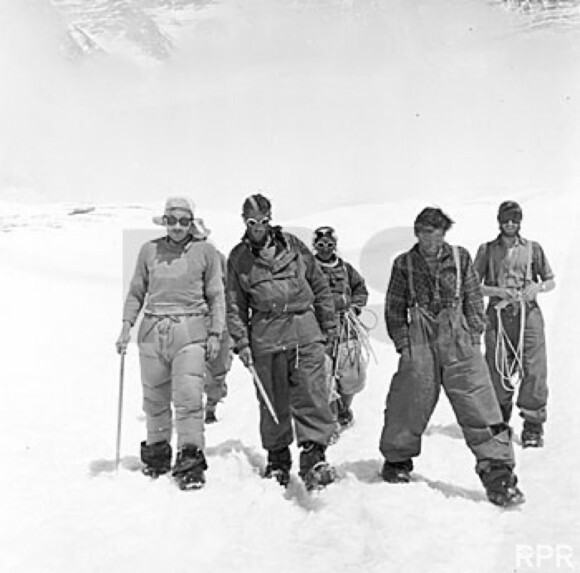 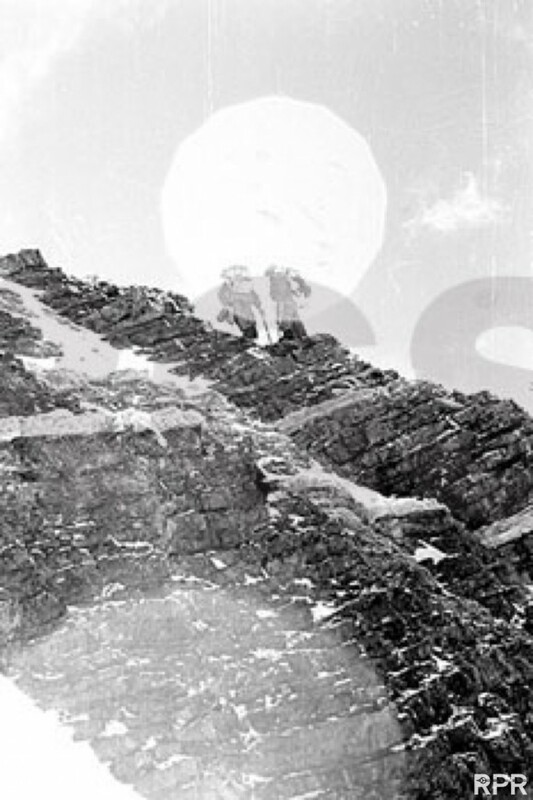 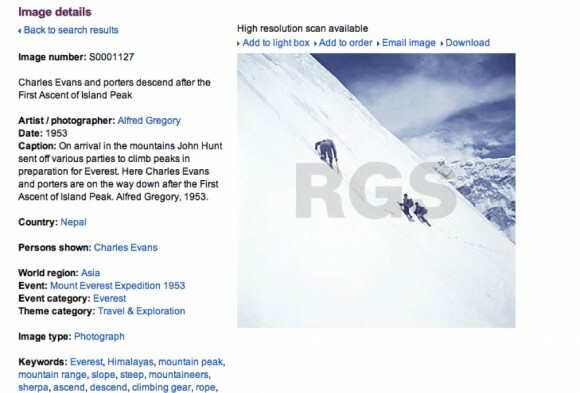 Tested by best Mountaineers in the Himalayas for more then 20 years..
Dr. Charles Evans & Tom Bourdillon on their way to the Summit, May 26th 1953..
2 British Explorers, ultra rare Rolex UK Heritage.. 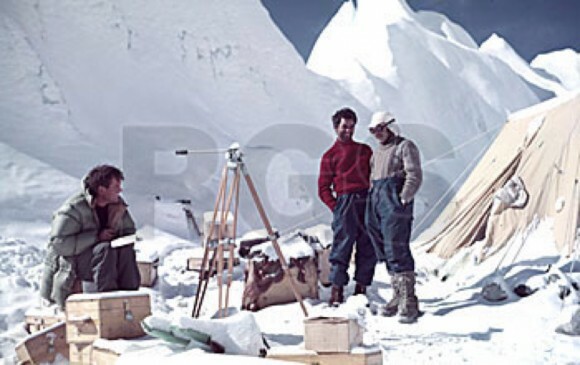 The secret codes of Times ( main sponsor ) journalist Jan Morris to secure the news and get it to england before the coronation of Queen Elizabeth..
Dr. Charles Evans & Tom Bourdillion right before the first British attempt to conquer Mt. 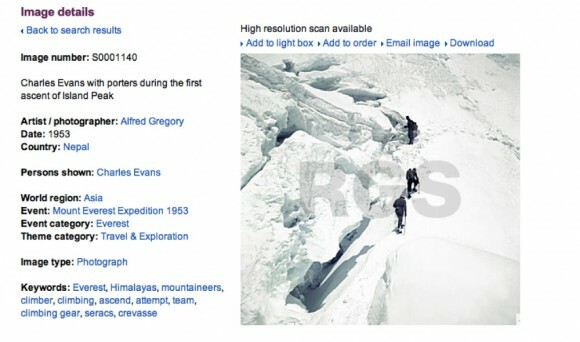 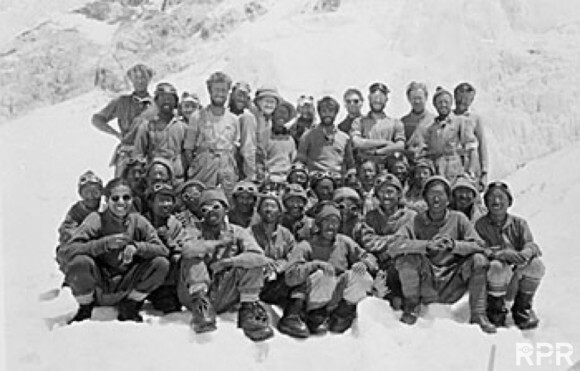 Everest, May 26th 1953..
All together, after Hillary & Tenzing made it to the top of Mt. Everest, 3 days later after Evans attempt..
George Bands 1953 Everest Rolex on the right & his 1955 Kangchenjunca, 3th highest and even more dangerous mountain of the world of which Charles Evans was team leader.. 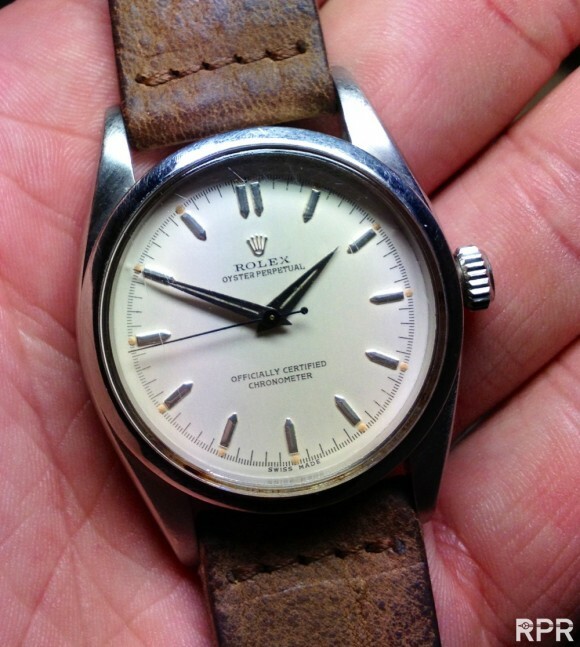 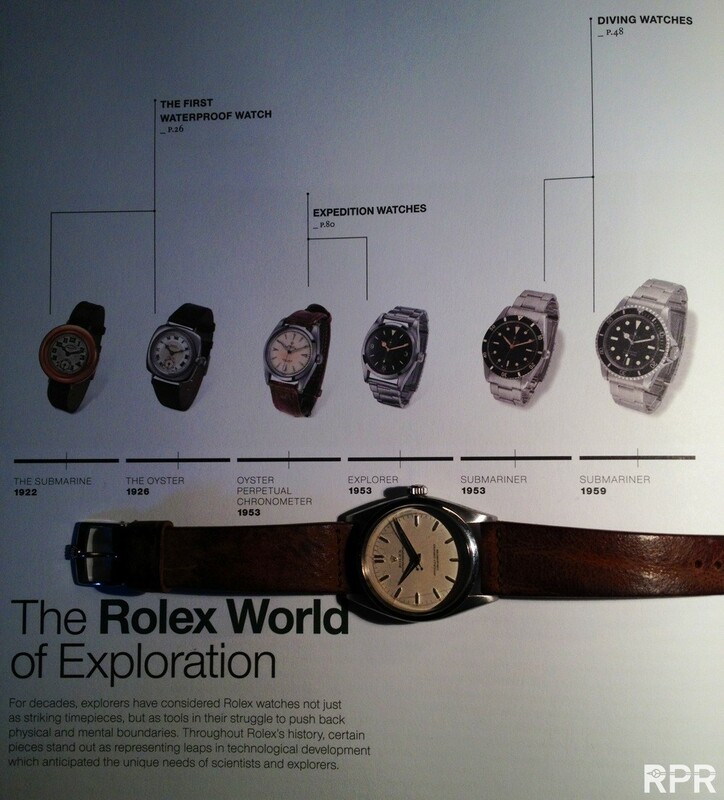 Pure Rolex roots, best provenance & durability test ever, start of Rolex to become the world leading watch company! 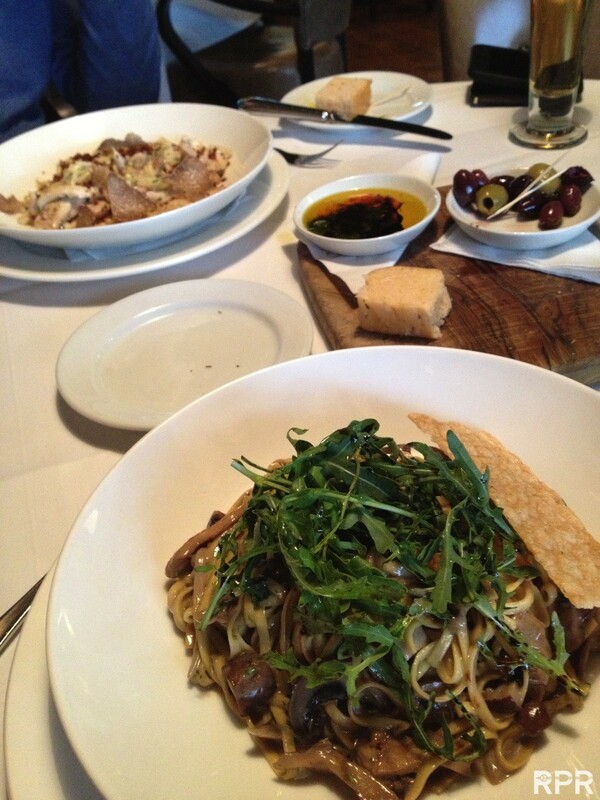 Exceptional moment…you even see George Band explaining me all his memories! What a humble explorer!!.. 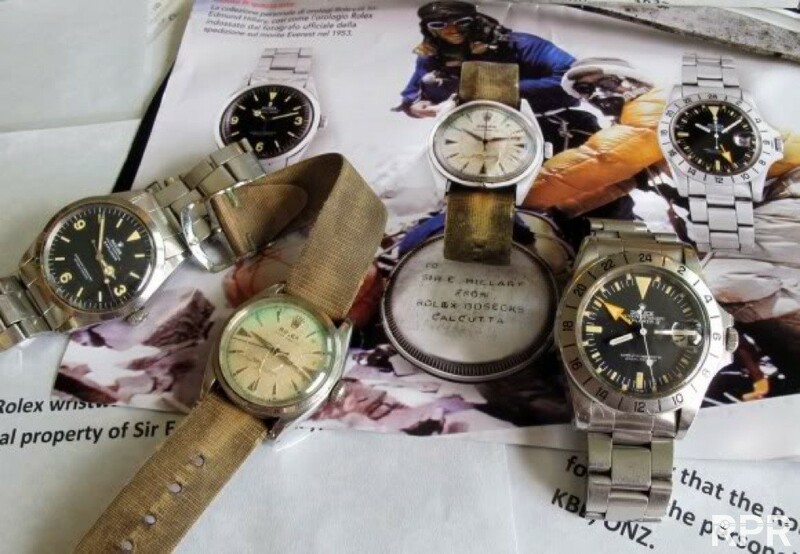 Sir Edmunds Hillary’s vintage Rolex collection, we managed to get back to New Sealand family trust..
Link to Everest @RGS IMAGES ..
A British Hero in the Sky..
Alfred Gregory’s Everest Rolex. 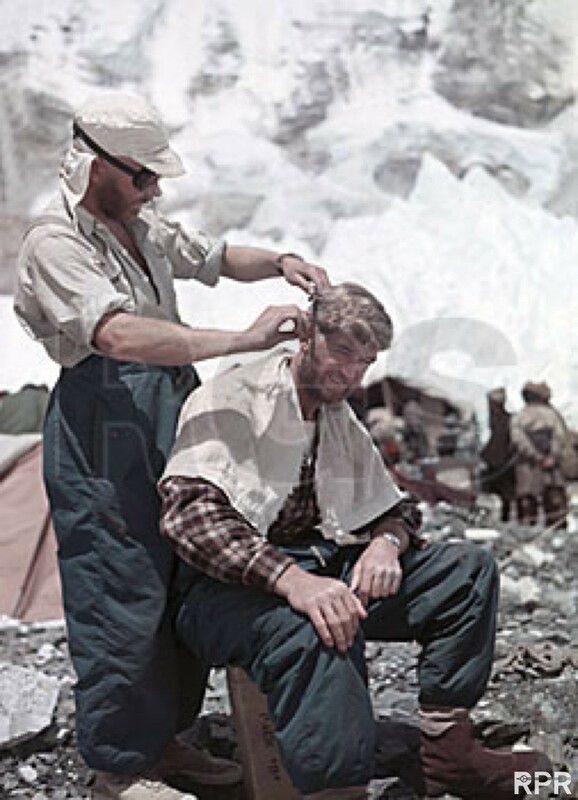 Being a photographer, he really knew how to capture the special moments during the British Expedition..
Evans was the leader of the expedition which first climbed Kangchenjunga, the world’s third highest peak, in 1955. 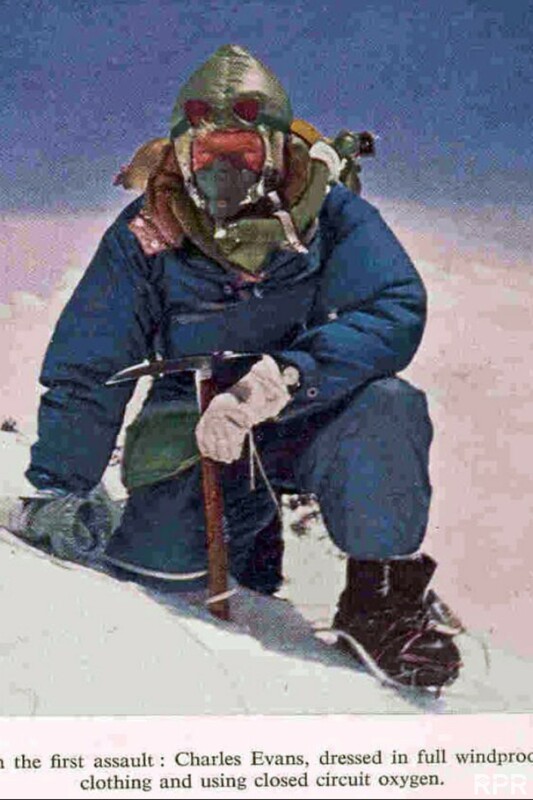 George Band, ex 1953 Everest, was also there. 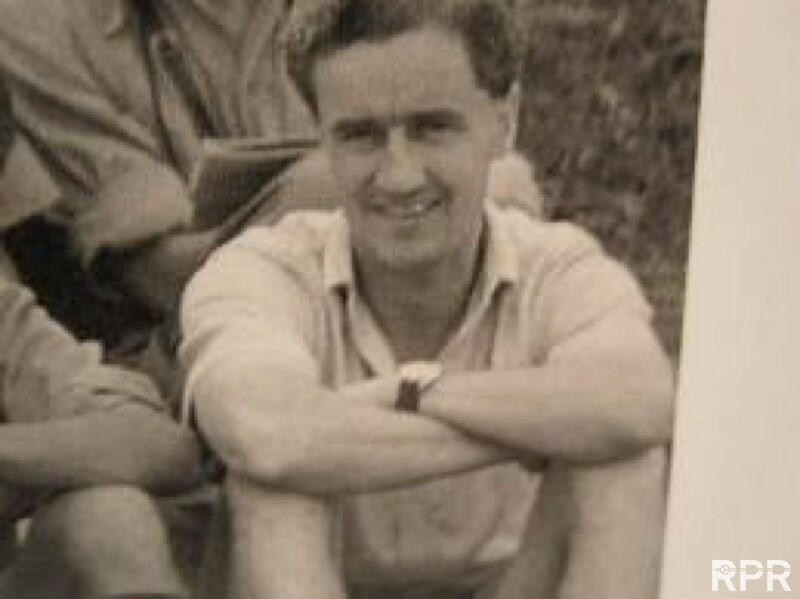 He served as the Principal of the University College of North Wales (now called Bangor University), from 1958 to 1984. 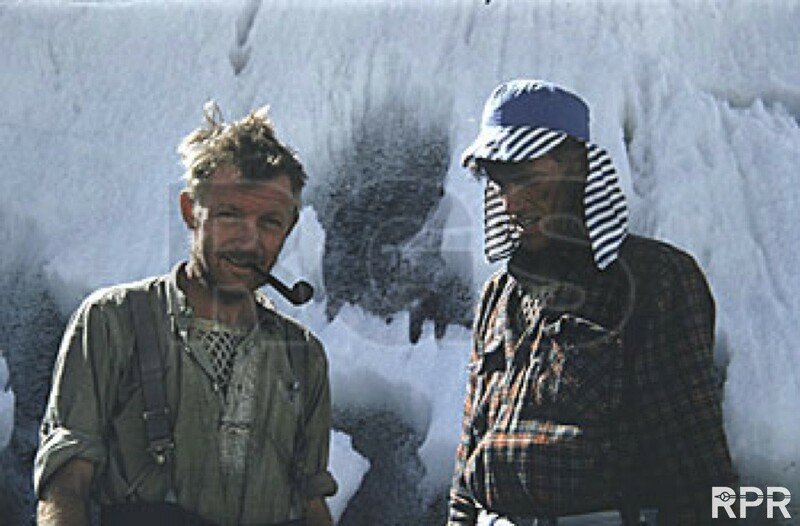 He was President of the Alpine Club from 1967 to 1970. 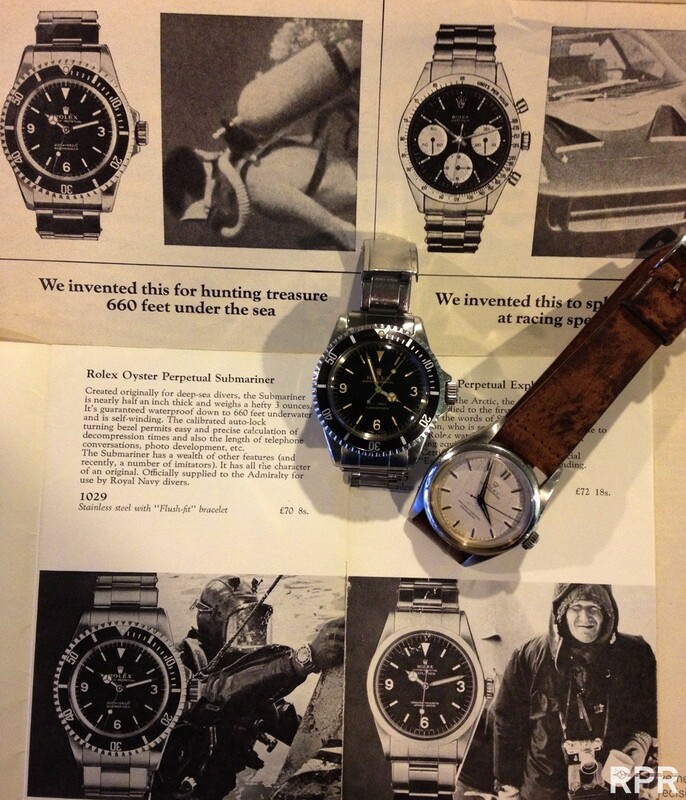 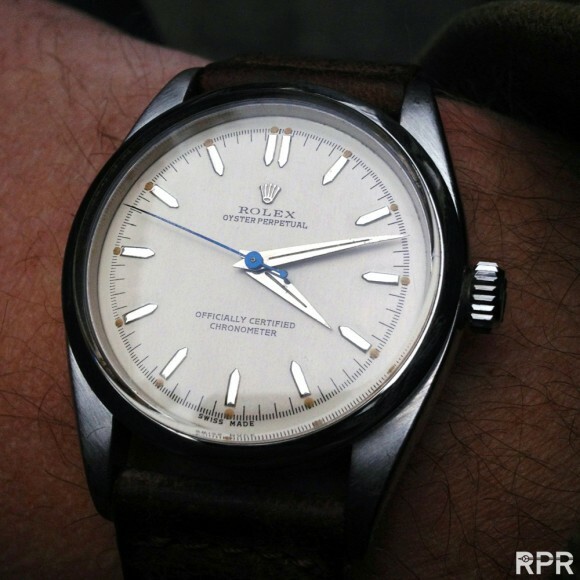 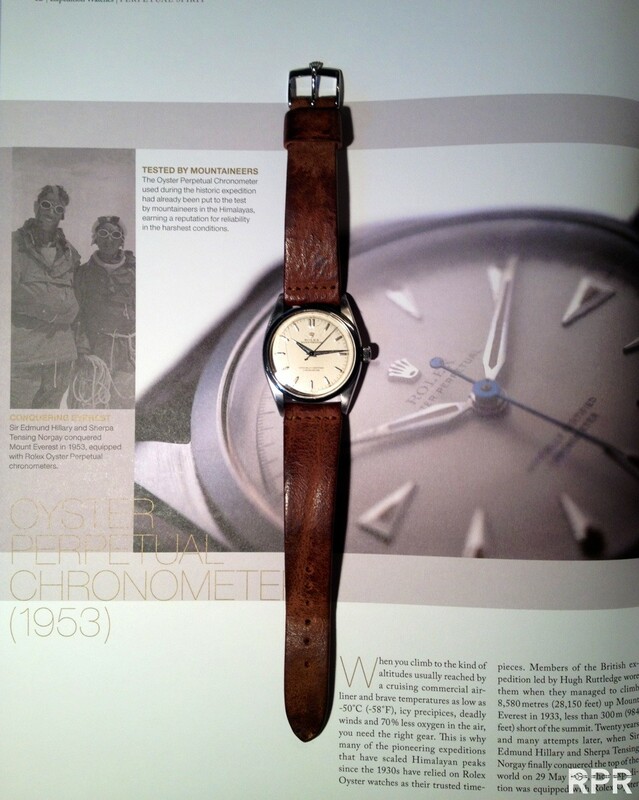 Directly after the conquest of Everest, Rolex started their famous “ToolWatch – SportWatch Evolution”.. 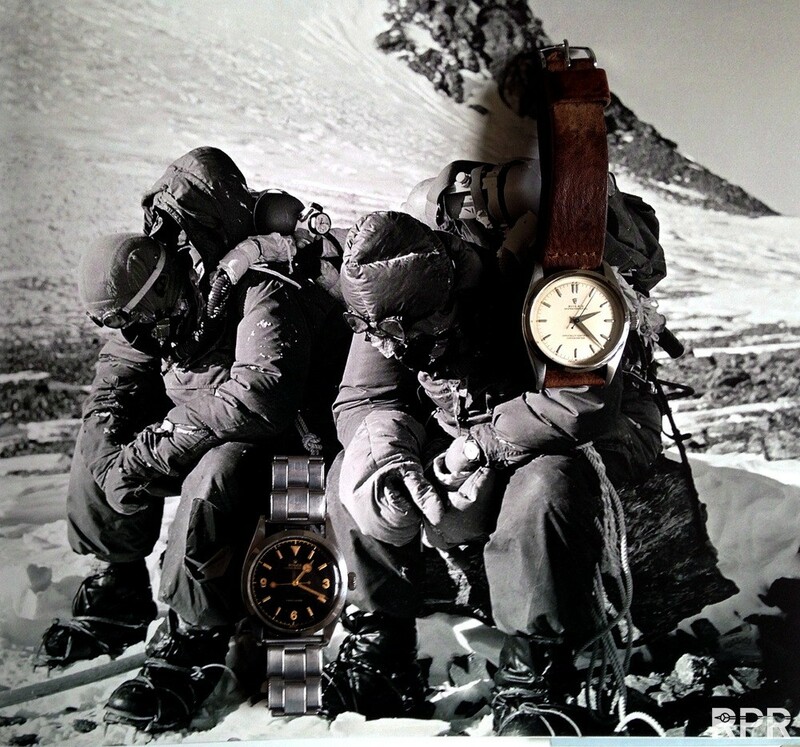 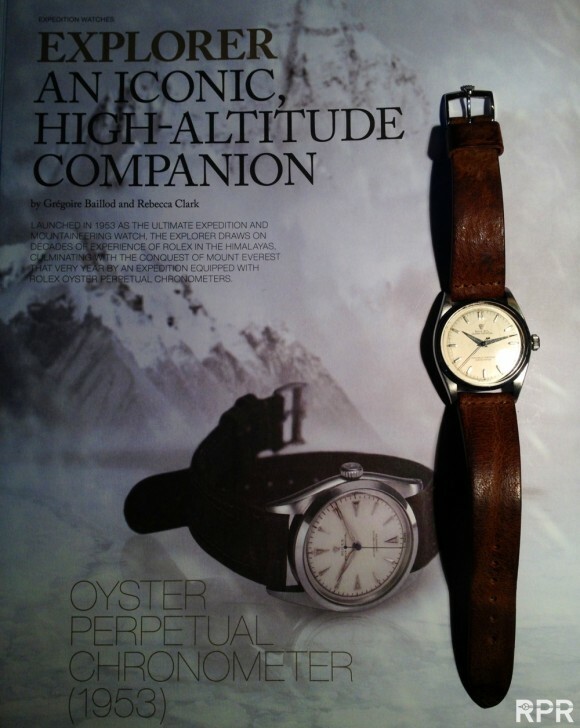 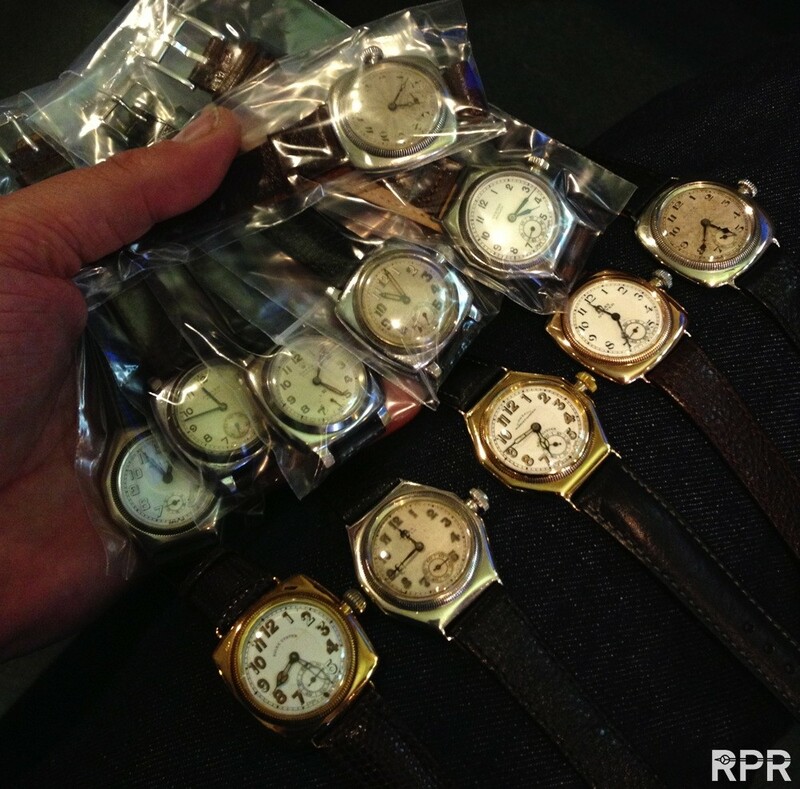 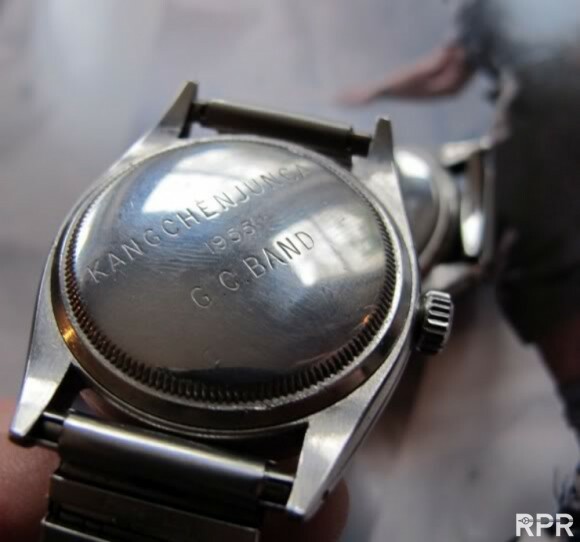 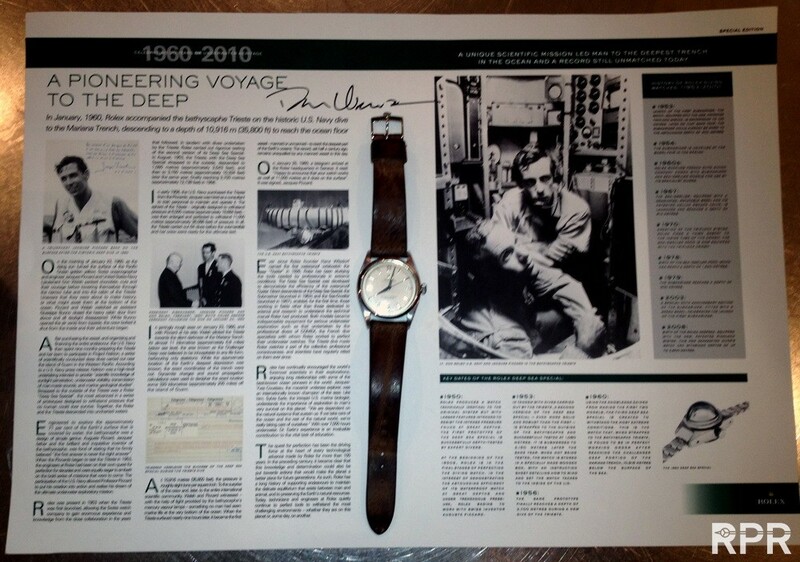 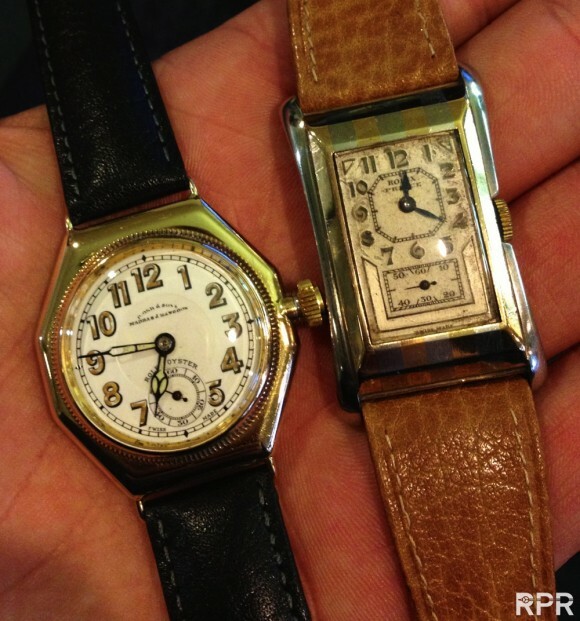 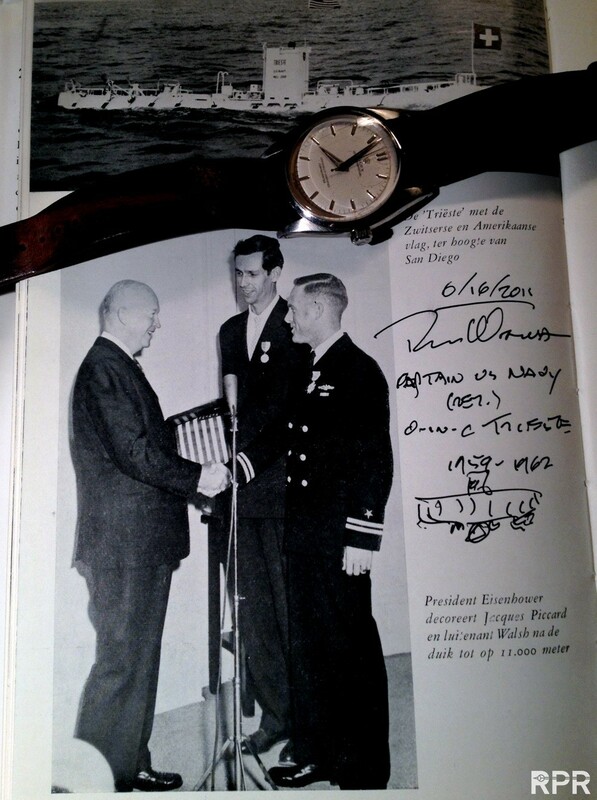 Historical breakpoint, Everest Toolwatch next to Rolex – Panerai Ref 6152/1..
Marianne Trench & Mt. 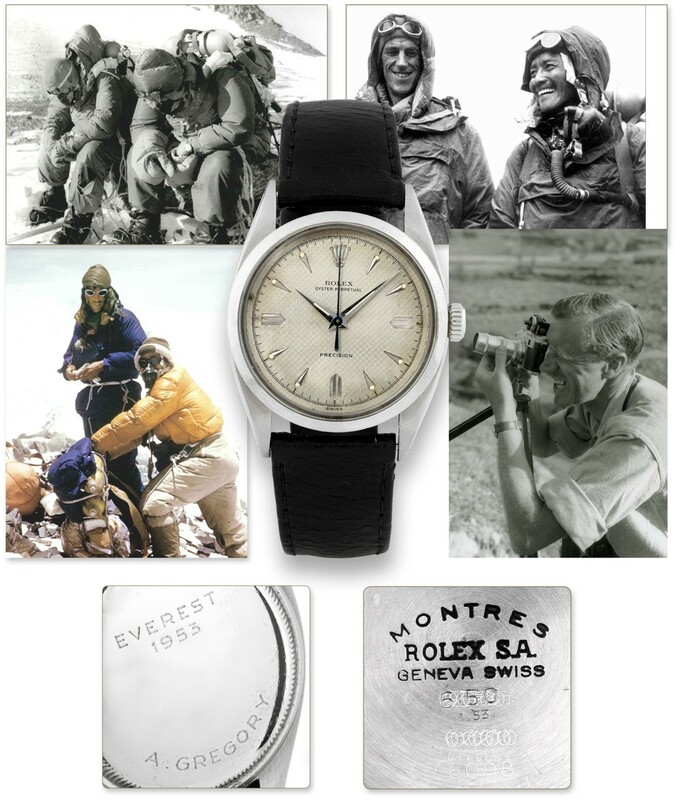 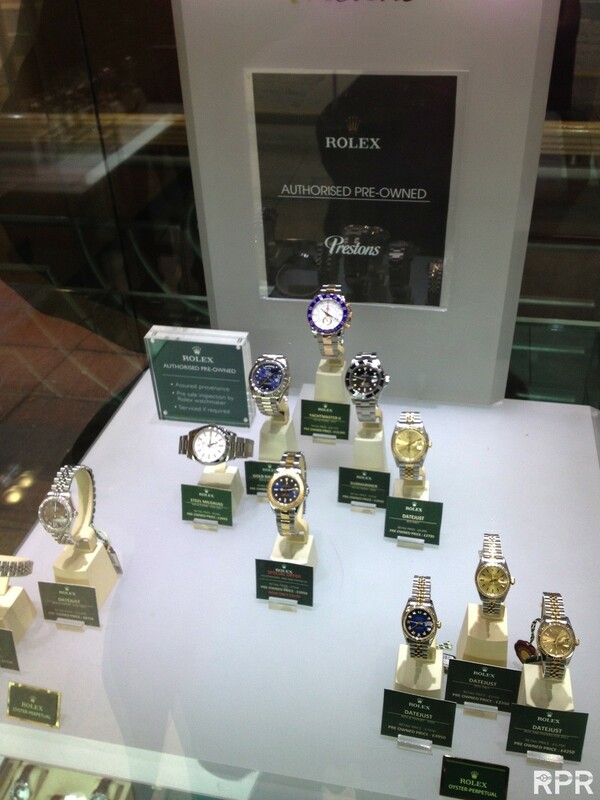 Everest.. From the Top of the World to the Bottom of the Sea, Rolex! 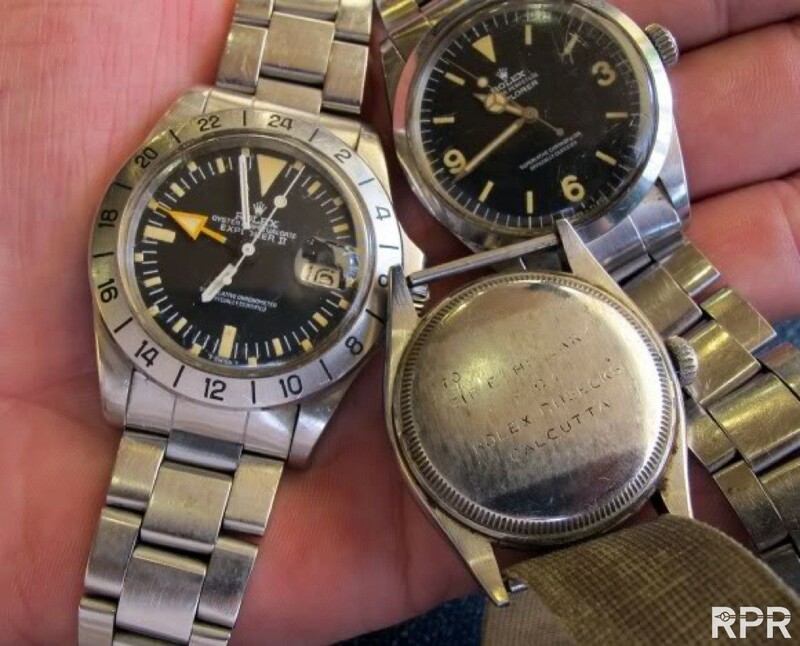 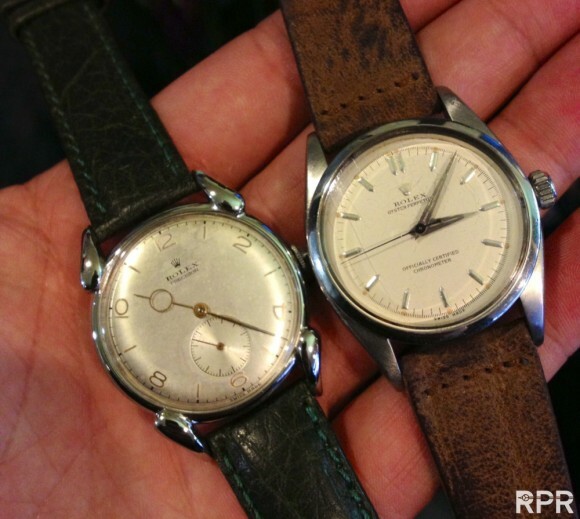 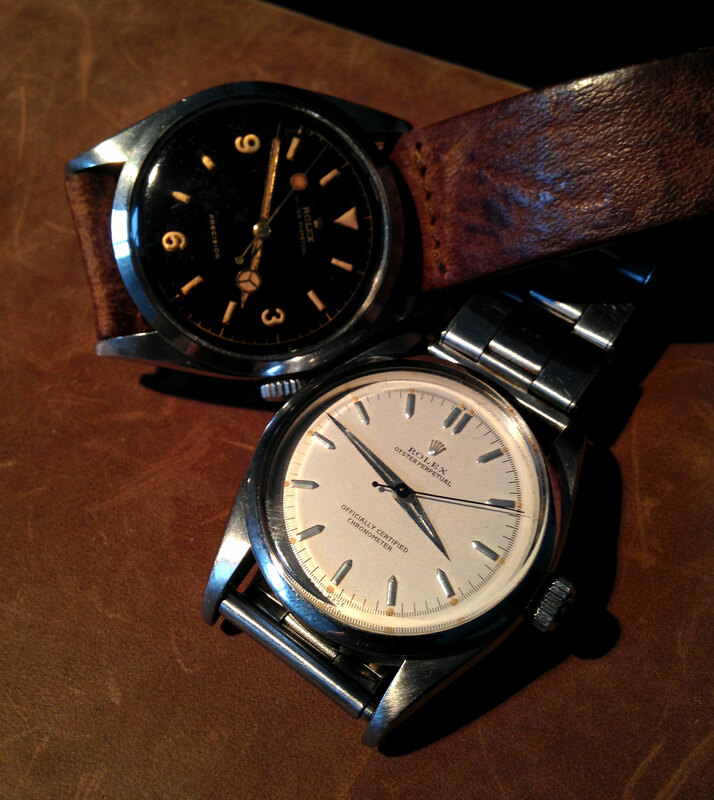 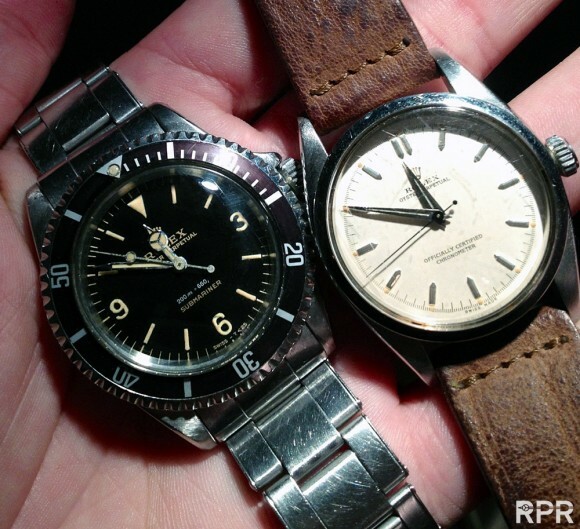 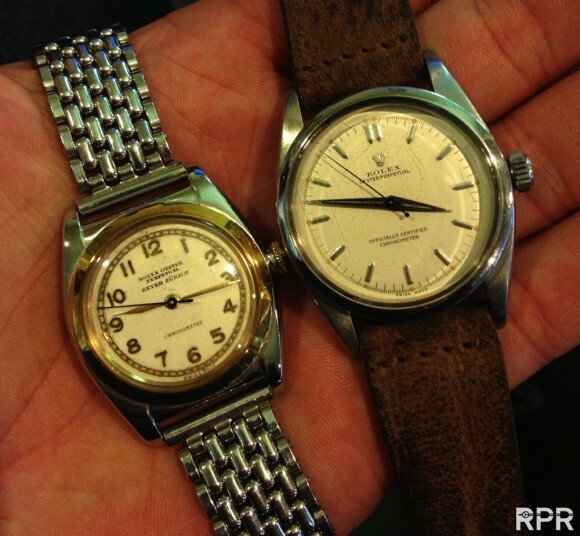 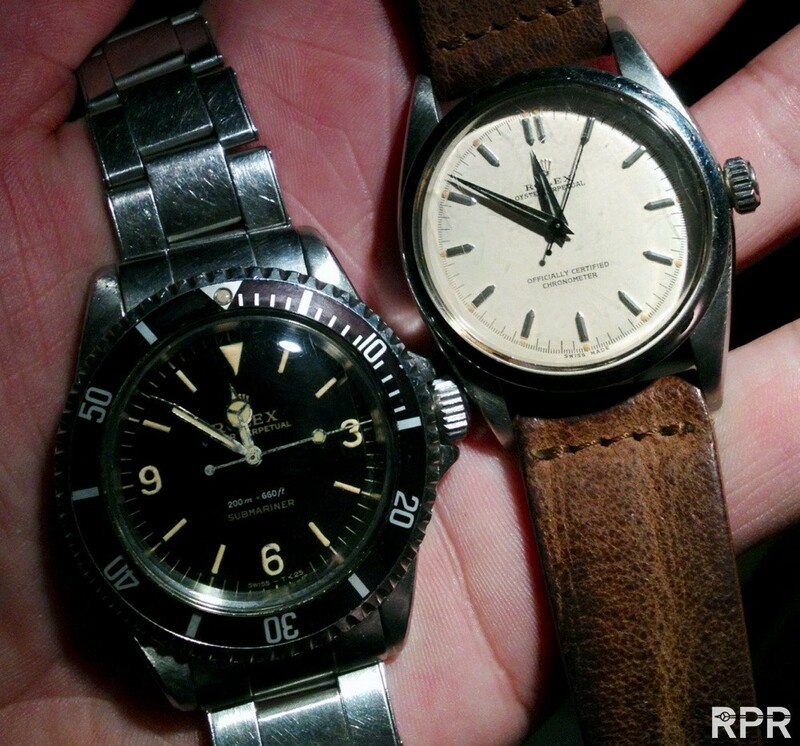 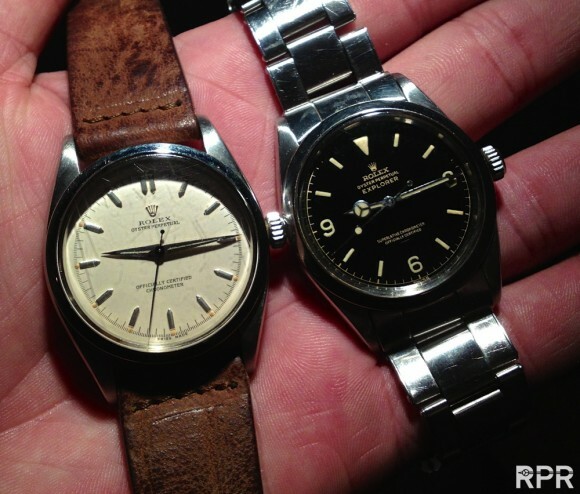 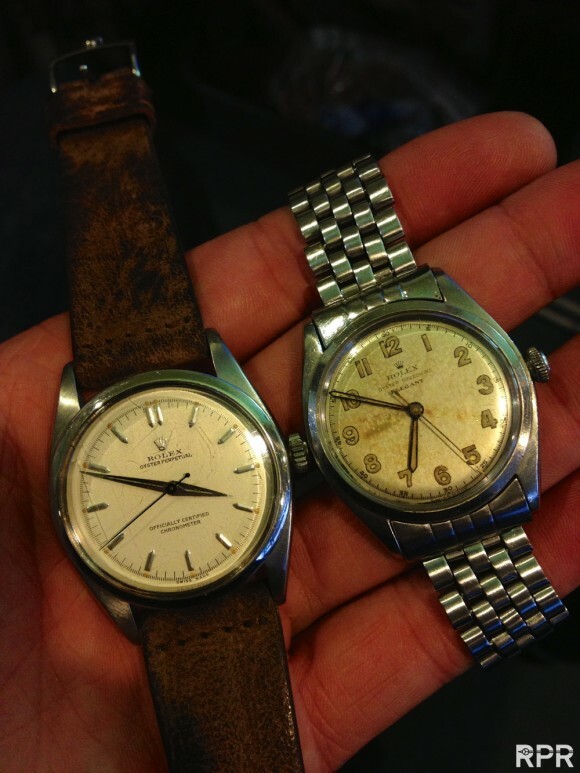 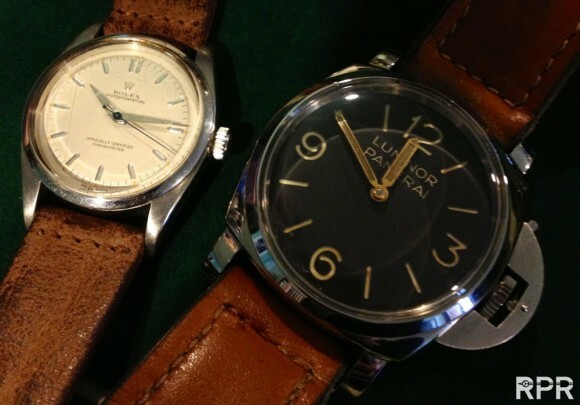 The real deal, Everest ’53 Evans Rolex next to wannabes.. 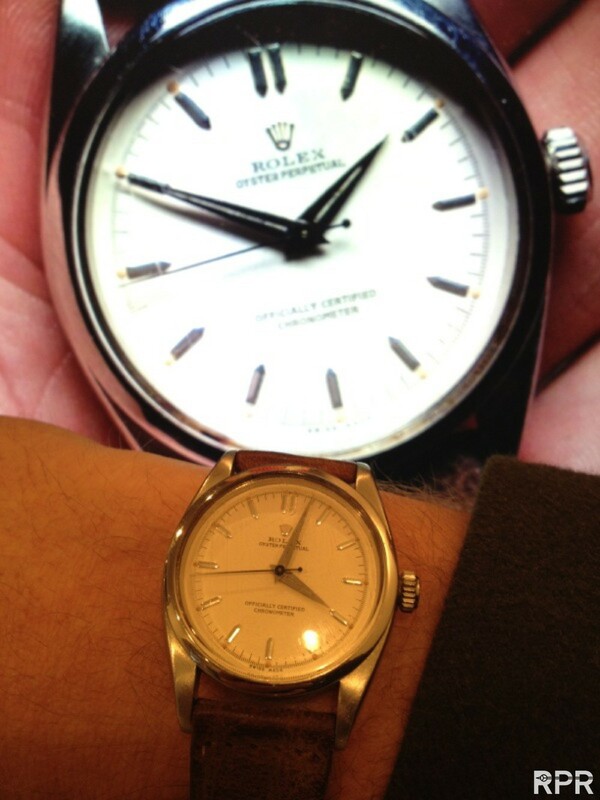 Early Beyer Bubbleback next to much bigger, Ref 6098, the Everest Rolex.. 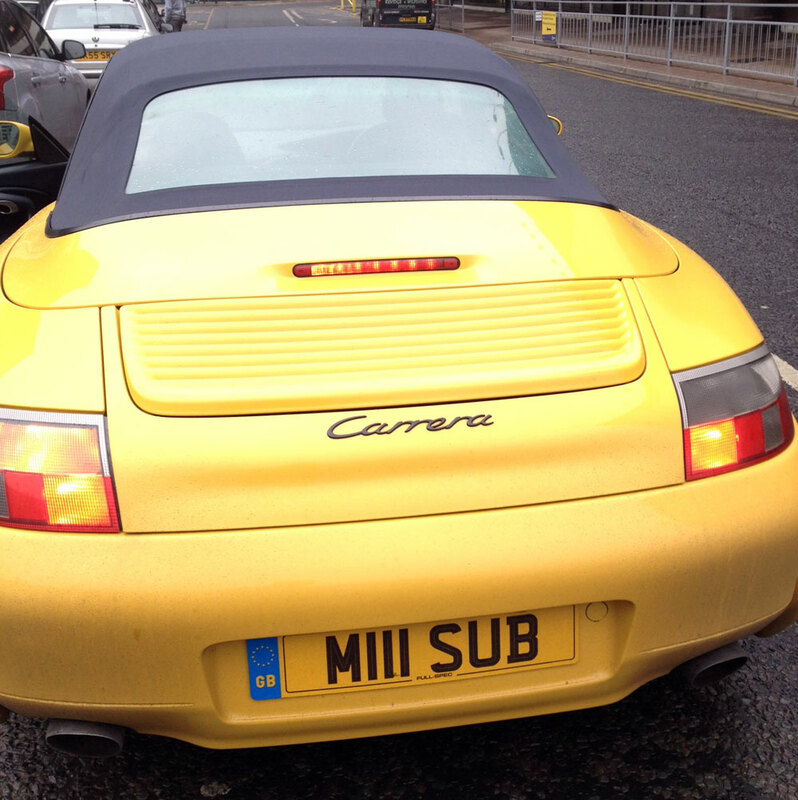 Interesting ‘Elegant’ of Mike Woods private collections..
My yellow cab! 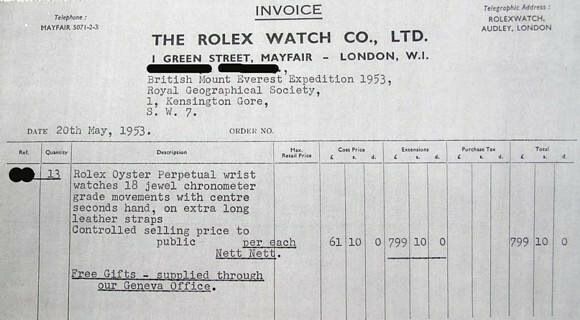 😉 Now look closely and you will notice how crazy some Rolex collectors can be!.. 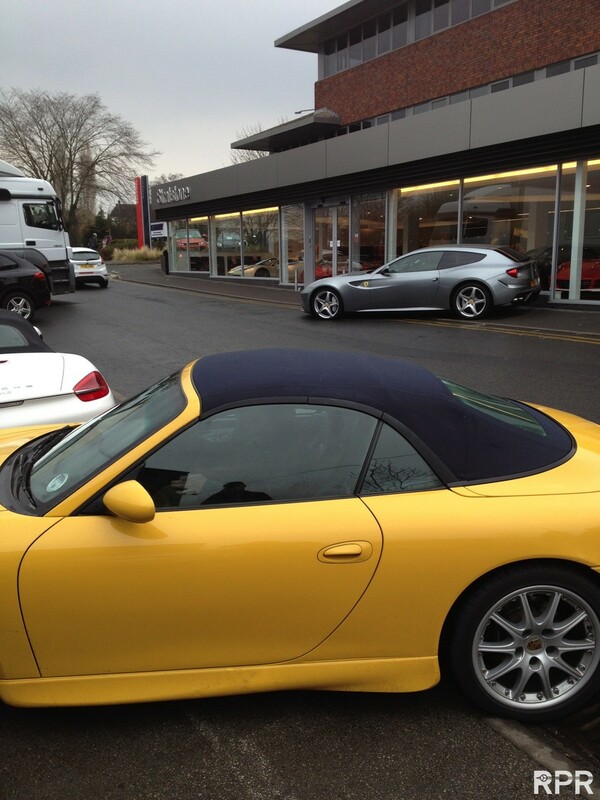 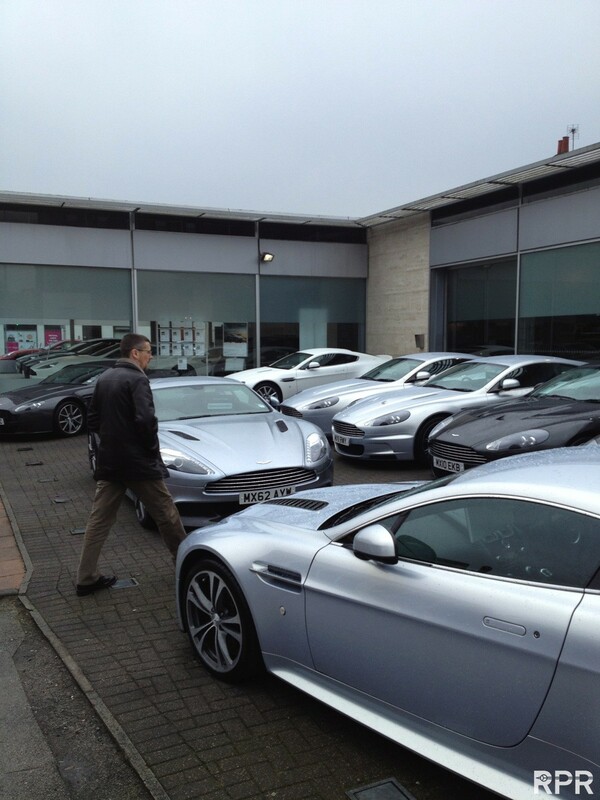 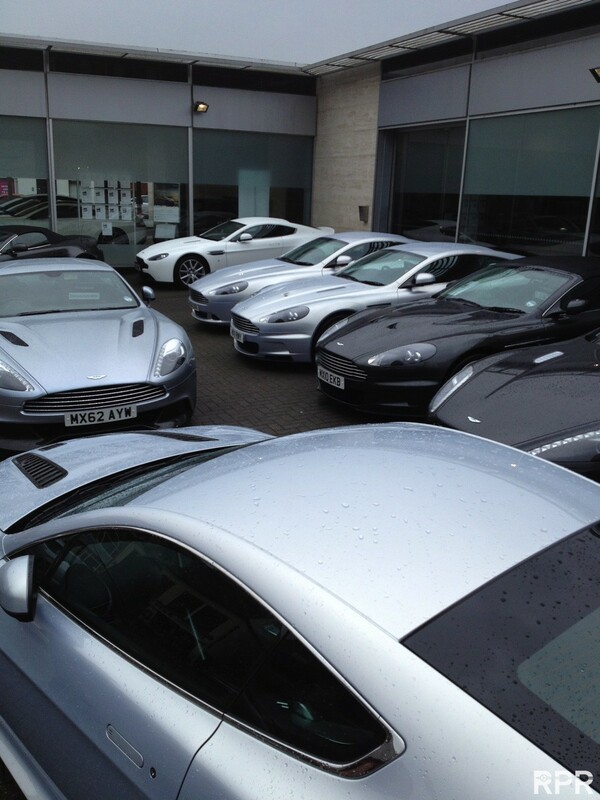 Mike is checking out his next ride, from yellow to red..
Back home, mission accomplished! 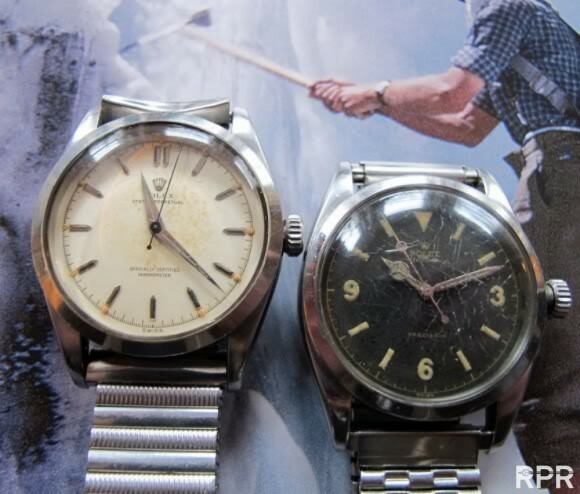 Many thanks to the family that gave me this unique opportunity owning a super rare piece of Rolex history & British mountaineering. 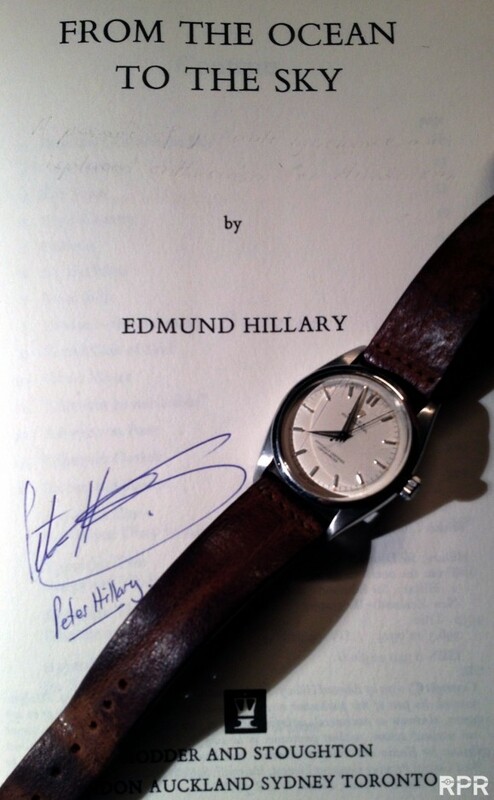 I’m very proud wearing it! 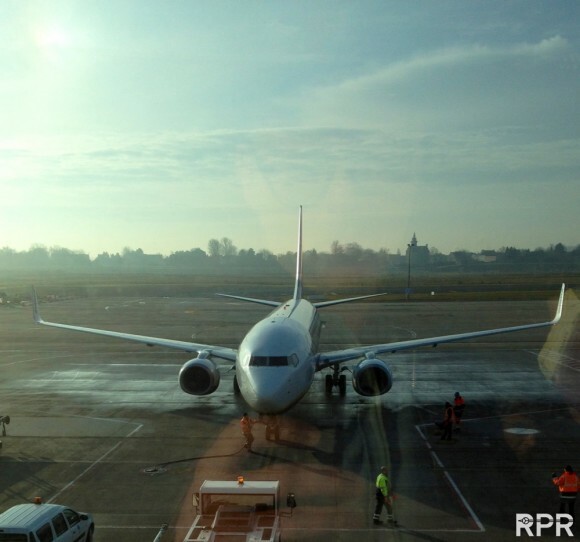 This post was written by Philipp on March 9, 2013.